Maybe you have a legendary man cave that all your buds love, but your lady isn’t sold. It’s time to turn your man cave into a media room everyone can enjoy by taking our advice on how to turn down the bro, bro. Let’s start with the basics: clean it up. No woman likes a dirty room or the game, “guess that scent”, so get organized and consider investing in a plug-in wall freshener. Or, just clean regularly, the choice is yours. These tips will help sophisticate your media room quicker than you can kick your bros out in favor of some quality time with that special lady. 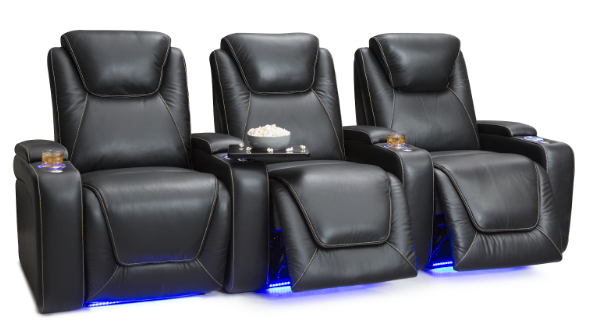 The single most important way to turn your man cave into a sophisticated media room is swapping out those old bean bag chairs from college for luxury Seatcraft home theater seating. These exquisitely tailored seats are both comfortable and innovative. Seatcraft knows how to upgrade any media room with add on accessories that will take your entertainment experience to prime time. 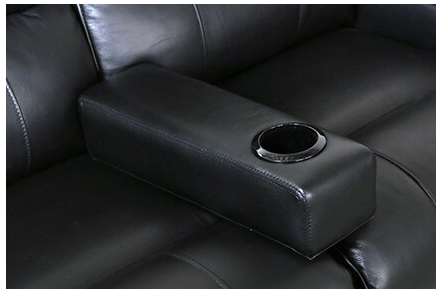 Adding a SoundShaker to your seat will surely change the way you watch movies. With easy wireless setup, your seat will shake and vibrate in sync with the action on-screen. Step 1: Take down the Natty Ice poster. We’re kidding. But really, if this is still in your man cave, it’s time for an upgrade. 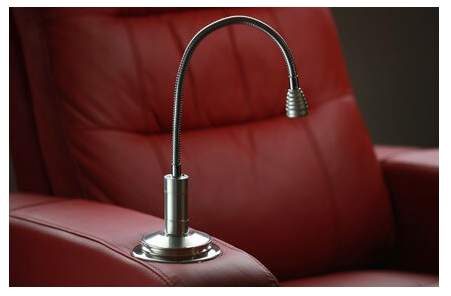 These Seatcraft LED Reading Lights are a nice touch to your media room. These help with decor and setting the mood with dim lighting. As for those walls, try adding movie posters consistent with a theme. Just don’t lead with Sharknado and you should be good! 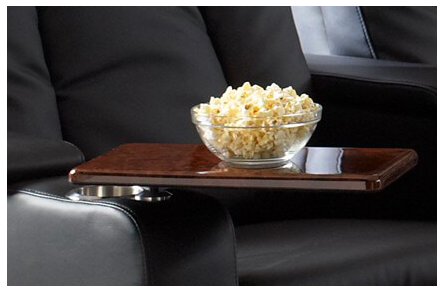 Bonus: head over to our friends at 4Seating.com to check out a huge selection of media room decor options. How else can you turn down the bro in your man cave? 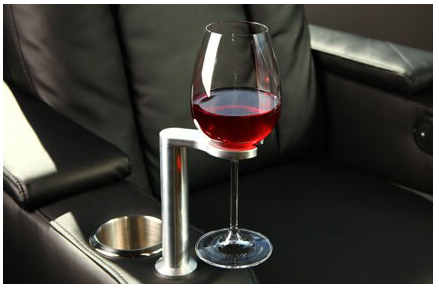 Add a wine caddy to your luxury seats from Seatcraft. Your lady will love the attention to detail and your home theater will gain instant sophistication. These wine caddies sport a stainless steel finish and no-spill technology that gives the luxurious look you want- and need- in your modernized media room. This wine caddy goes with any Seatcraft chair like cold beer goes with a good burger. Add a wine caddy to your seat and thank us later. If you’re not drinking alcohol or are in the market for more kid-friendly beverages, craft sodas are making a comeback and are a great touch for any beverage bar. Impress your friends (and significant others) with lesser known flavors that they won’t find at their local grocery store, like these Goose Island Craft Sodas. What better way to watch a movie than sharing a seat with your significant other? A love seat is the way to go if you want to stay close during those thriller movies. We all know it’s better to hold onto someone when Hannibal Lector makes an appearance. This Seatcraft Loveseat Slide Arm slides into any loveseat to create a shared arm. Just as easily as it slides into your loveseat, it can be removed to create a standard row where you can cozy up to your significant other. With both brown and black leather options, this luxury slide arm will go with any Seatcraft seat you decide to upgrade your media room with. Everyone loves snacks to go with their movies, so be sure to stock up! We recommend buying individually-wrapped snacks in bulk so that large portions don’t go to waste in between movies. Just remember to keep your media room relatively cool at all times if you elect to stock it with chocolate! Go the extra mile and add a Seatcraft Swivel Tray Table to your seat to go along with your LED reading light. It is a great addition to your luxury seats and will allow you to make dinner and a movie easier to accomplish and more romantic than ever. They come in brown burlwood and black to match your Seatcraft seats. Swiveling at 360 degrees makes everything accessible and easy to reach during your movie. A sure fire way to make your man cave more inviting is to add some decorative throw pillows and blankets to your home theater. This will make your media room cozy and enjoyable for both you and your significant other. It is also a great way to lighten up your dark man cave by adding color! If you want to keep the walls simple and sans artwork, then definitely add some colorful pillows and blankets. This also doubles as a good excuse to get cozy and share a blanket. Ready to turn down the bro and convince that special someone to spend more time in your man cave media room? Feel free to contact the pros at Seatcraft and we’ll be happy to help you figure out the best options for your room! This entry was posted in Home Theater and tagged action movies, mancave, sports on June 3, 2017 by seatcraft.